I’ve written before about ten essential items that you should carry in your pack every time you step into the woods. Those ten essentials could mean the difference between life and death (OK, maybe just severe discomfort!) in case things go wrong while on a hike in the wilderness. I won’t rehash those items again here. If you’d like to review that story, check on the club website for "Dan's Take on the Survival Essentials” dated August 2014. But today I’d like to talk about what I will call an “outdoor contingency kit” that I’ve assembled and that I always carry in my pack. This kit carries some of the small items that you will find in published lists of the ten essentials, but augmented by my personal choices. 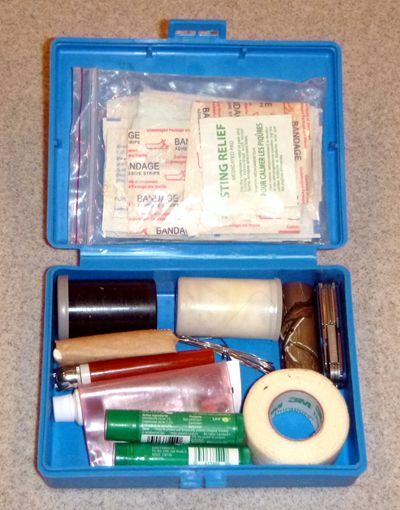 First Aid: I use the guts of a small commercial off-the shelf first-aid kit to start, but I make sure that it has an adequate number of band-aids, gauze pads, and extra alcohol wipes. To that I add a small roll of medical tape, some Blistex, and a small tube of first-aid cream, like Neosporin. Abrasions, cuts, pokes, and scrapes are an inevitable part of spending time outdoors. Some folks call it “dirt time”. That’s the reason you need to take good care of any minor wounds as soon as they happen to prevent infection. Wipe the wound clean with an alcohol swab. Smear the wound with first-aid cream. Then patch the wound with a band-aid, or if it is a bigger wound, with a gauze pad wrapped in medical tape. It’s a good idea to wrap even a small band-aid cut with the medical tape to keep as much dirt away from the wound as possible. The first-aid cream really helps a wound to heal faster. I’m a firm believer. Your lips are particularly vulnerable to drying and cracking when you spend all day, every day in the outdoors. I usually try to take a tube of Blistex in a shirt or pants pocket or in an easily accessible pack pocket when I head outdoors. But too often, I forget. When you start getting that dry lips feeling several hours into a hike, you NEED that lip balm. By packing a couple of extras in my contingency kit, I know that I always have some on hand. In a pinch, Blistex can take the place of a light-duty grease lubricant for a squeaking sling swivel for example. I’ve also used it as sun-screen for my nose. Fire Making: I’ve never had to make a survival fire, and I hope that I never will. Nevertheless, getting somehow stuck overnight in the backcountry can be such a serious survival problem that you’d better be able to make a warming fire for yourself. To help easily start a fire, I pack a butane lighter, waterproof matches, standard matches, some tissue paper, Vaseline-soaked cotton balls, and hexamine solid fuel tablets (in 35mm film canisters). If I can’t get a fire started with all of that, then I guess I deserve to succumb to the elements. Of course elsewhere in my pack I usually carry my Schrade survival hatchet, some sort of small saw, or a large fixed blade knife to help process wood for a fire as well. Repair Tools and Materials: In my outdoor contingency kit I pack a Leatherman Squirt P4 multi-tool. It’s pretty tiny, but it includes a useful assortment of tools: Pliers, knife blade, wire cutters, three screwdrivers, a file, a bottle opener, and an awl. I usually do not carry a full-size Leatherman on me due to weight, so having the Squirt available when I need pliers, file, or a screwdriver is great. I also pack a small roll of camo duct tape – everyone knows how useful duct tape is. I also carry about 3 to 4 feet of .020” stainless steel safety wire. With the Squirt I can cut the wire to size, wrap, and twist to make quite strong field expedient equipment repairs. In emergency survival situations, the wire can also be used to make small animal traps or snares. So there you have it. I’ve actually assembled a couple of these kits because I have several different packs that I use at different times. Then I don’t need to remember to move my kit from one pack to another, and suffer the possibility of grabbing a pack that doesn’t have a kit in it. One of the mistakes you can make is to never crack into the kit and use stuff from it. The kit is there for a purpose. Go ahead and make use of the items when you’re in the field! You can always replenish later. A good way to improve this kit is to use a mini-mess kit container in place of the Dillon box. I found just such a thing on Amazon as I was writing this article. It measures 4.9” x 6.2” x 1.9” – pretty close to the size of the Dillon box. Search for “Sodial Mess Tin” and you should be able to find it. Or any similarly sized metal mess tin with a handle. 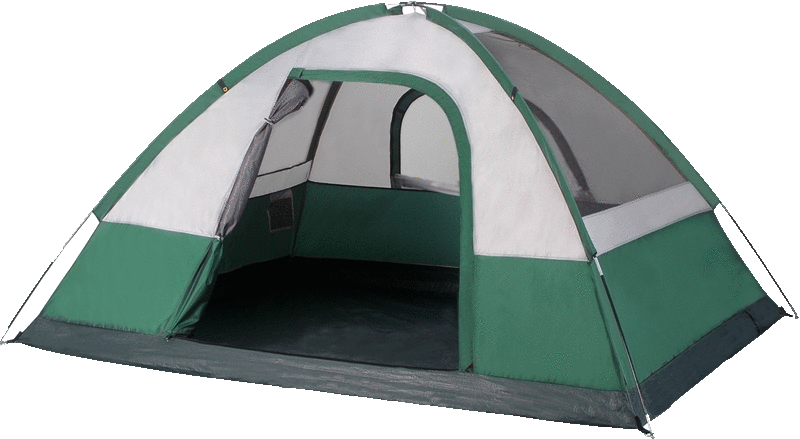 The advantage is that being stainless steel, in emergency situations, you can cook in it or boil water for drinking. There might even be a couple of other small items that I could still add. So what’s in your outdoor contingency kit?